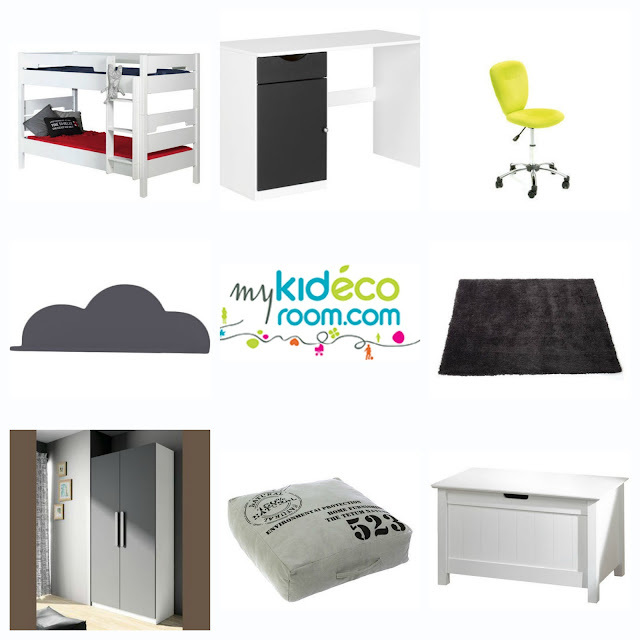 MyKidEcoRoom - Kids bedroom makeover wishlist! When we moved house I was 7 months pregnant and decorating was the last thing on my mind! Unfortunately this meant the walls in the kids rooms were painted white and furniture was placed in there for practicality rather than looking good. However now we have been here for almost 2 years and Evelyn and James are both growing up we have decided to made their bedroom a lovely space to be in rather than "just a bedroom". I got online and started looking for inspiration when I discovered the website MyKidEcoRoom. MyKidEcoRoom is a beautiful website dedicated to offering exclusive eco-friendly furniture for baby's and children. The website features a wide range of children's bedrooms and baby's nursery furniture and accessories with sleek lines and contempory design there really is something to suit all tastes. Whether its a classic solid wood look, modern sleek lines or bright bursts of colour you are looking for you will find it at MyKidEcoRoom! There were so many great items on the website I fell in love with lots of the pieces and compiled a wishlist of all the things I would get from the MyKidEcoRoom to create a dream bedroom for James and Evelyn. Here are my top wishlist items. Bow Bunk Bed in white - Since James and Evelyn are sharing a room a bunk bed is the best option for us as it creates more room in the bedroom. I love that this one also provides space for extra storage underneath as we all know you can never have to much storage when kids are involved! Cargo Desk in white - Now that James is at school and receiving regular homework I wanted him to have his own little space to go to work and do his homework. This desk provides him the perfect space to do that and has a storage space to store all his things in. I love the added extra of the fun chalkboard painted door for that quirky touch. Pop Desk Chair in green - A desk wouldn't be complete without a chair and this funky green provides a fantastic pop of colour! Altea shelf in Charcoal grey - How adorable are these cloud shape inspired shelves? I would love to have a few of these charcoal grey ones dotted around the room for all of James LEGO bits and pieces so he could display them properly. They are also available in an array of colours including pinks and purples. Snug Rug in Grey - This rug looks so cosy and snugly I could just about dive in to it right now! I would love a nice rug in the room to provide a cosy place for James and Evelyn to play or sit and read and this rug totally fits the breif. Its also available in a lovely deep red and cream. Planet Wardrobe in white and grey - I hold my hands up and admit I just can't resist buying clothes for the kids, they are just so cute aren't they!? So a good solid sturdy wardrobe is a must and I love the modern and clean design of this Planet wardrobe. The soft close doors are a fantastic added bonus especially as Evelyn would be in the bedroom and it gives me piece of mind about her fingers getting trapped. Inside features 2 fixed shelves and ample hanging space for all of their clothing. Loft Pouf Floor Cushion - I mentioned above that I wanted a space for James and Evelyn to relax in the bedroom and these large floor cushions would be perfect for that. Measuring 70 X 70cm there is plenty of space for any child to chill out with a book on one of these soft cushions. White Swan Toy Box - Evelyn has lots of soft toys and teddies so I would definitely want something like this beautiful classic toy box in their bedroom. I adore the clean lines and classic look of this one and its large enough to fit a good amount of toys inside! So there you have it our MyKidEcoRoom wishlist, do you like any of our choices? As you can see we have gone for quite a monochrome look with pops of colour which I would probably add more off through bedding and a few pictures on the wall. MyKidEcoRoom really do have so much to offer it is definitely worth checking it out if you are thinking of redecorating or renewing some of your childs furniture. Such lovely choices - sometimes I'd rather have a kids room than a grown up one! Some lovely furniture choices, I would have loved a bunk bed as a kid!